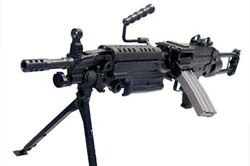 In Counter-Strike Source, the M249, also known as the Para, is a saw machine gun with a massive 100 round clip and and extremely powerful rounds. In real life this gun would be mounted on a bi-pod as the recoil would be too intense to control in hand. However this is a game, so in Counter-Strike, players are free to run around with it in a Rambo like fashion. The Para is great at providing covering fire for your team-mates, pinning down opponents and is definitely the best weapon in CS:S against multiple attackers. The high caliber Parabellum rounds allow shots to penetrate through multiple targets, so multi-kills are very common. This weapon is ideal for rushing, choking up bottlenecks in maps, and driving a sense of fear into even the fiercest of opponents. When at close range, it's important to control your recoil in an almost small circle-like fashion, allowing for the randomness of the shots to 'tighten' up your recoil. See my article on how to control spray fire. At long range it's important to burst fire your shot's in 1-2 bullet bursts. The para has has a huge spread of recoil causing bullets to separate further and further from each other in a very short distance. This makes bursting much more effective than spraying at long range. Holding this weapon really slows you down, so it's important to master the timing of switching to the Knife and the Para (when enemies are not around).